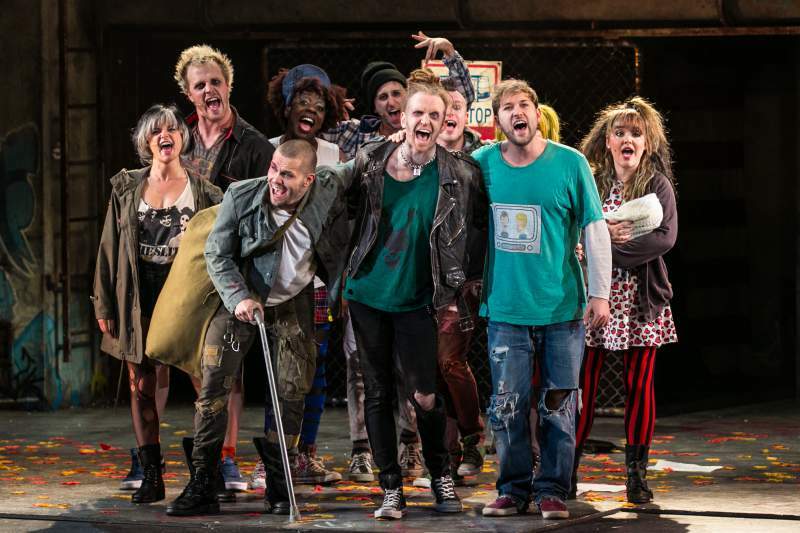 American Idiot has won multiple awards and garnered much praise in its existence as a musical. Springing to life inspired by and based fully around the songs of Green Day‘s 2004 album of the same name, the stage adaptation seeks to take the strong narrative the rock-opera, concept album offers up and really run with it. Sunderland Empire hosts the show until Saturday 28th May, and as a massive Green Day fan, I was very excited to get the chance to finally see the show. Being a Green Day fan is an important point to mention, as a fair portion of the audience were there in Green Day t-shirts, and the energy of the faster, more punk-influenced songs felt as much like being at a rock show as it did musical theatre. Even the slower, more ballad-driven songs still felt like that was the moment in a gig where the front man comes out by himself, with only a guitar, for an earnest rendition of the song he’d written about a recent heartbreak. These moments are where Newton Faulkner really shined, his voice is very suited to the slower, more stripped-back tracks and really lit up the stage with captivating subtlety. The American accents on show were also perfectly fine, and easy to get swept away with, and such is the strength of the narrative in the tracks, that dialogue is minimal, merely serving as diary entries as the stories spring to life musically. There’s an honourable mention too for Newton Faulkner’s dancing, it’s clearly far from something he’s confident in, but there’s a charm in that, and such is his connection with the character of Johnny that it all feels like part of the character, and his comic timing was also surprisingly spot-on. There’s three narratives to follow at once, and the three leads all deliver, as does Amelia Lily in the role of Whatsername, the vocals on show are all incredible and really do the songs justice. The powerful voices in the choruses and clever use of the energy of a live band again really give this musical a different vibe. The set itself is highly impressive too, and the use of a TV screen is wonderfully inventive, but the star of the show is the songs Green Day wrote more than a decade ago. The political undertones and social commentary is heartbreakingly still relevant, and watching these lost souls, products of a system that does little to help them is tough, but there’s enough moments of inspiration that keeps just that little bit of hope twinkling away. Thankfully that all manages to really offset the cornier moments of middle finger waving, f-bomb dropping attitude, as the sincerity on show wins through. American Idiot is at Sunderland Empire until Saturday 28th May.